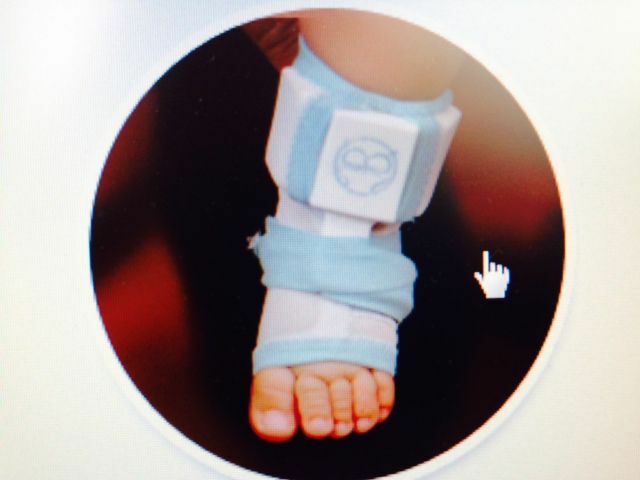 Owlet is an ankle-worn health tracking device for your baby, with an accompanying app that provides your baby's health "vitals" readout at any time. The device uses a system called Pulse Oximetry, which has been used in hospitals and pediatrics for years. The "smart sock" using infrared and red lights tracks a baby's heart rate, oxygen levels, skin temperature and even provides rollover alerts during sleep. This information can then be transmitted to a smartphone app or you can plug in the smart sock to a USB to see vitals on your computer and/or connect to your home Wifi network to see readouts on any connected device. The sock's electrical components are housed in a resistant silicone case for safety, and it's wireless, and hypoallergenic. Not only does Owlet track your baby's health, but offers a peace of mind and comfort to new parents. For more information, you can go to Owlet's website at Owletcare.com.